Some light snow is falling over Seattle now, as a weak upper level disturbance moves though. Perhaps a half-inch on the ground in North Seattle. But in general, Seattle has been left out of the bounty, even though we are cold enough to snow. More snow north, south, east and west of us. But why are we being short changed? Let's start by showing the distribution of snow depth tonight at 10 PM from the NOAA National Snow Analysis. On the left, is last night and on the right, 10 days ago. 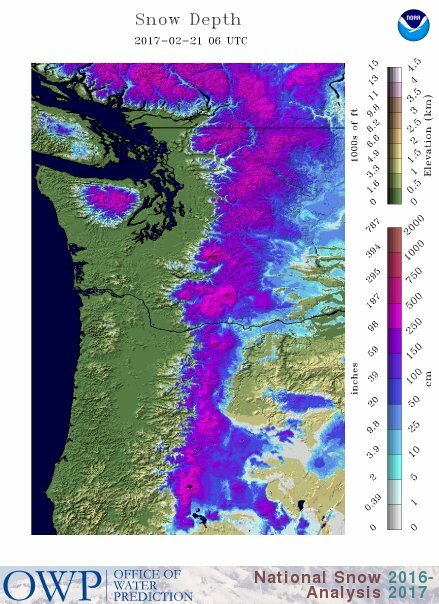 Quite a bit more over the west lowlands, particular south of Olympia, and east of the Cascade crest. Very light amounts over Seattle and south King County. A year ago? More snow than this year over the Oregon Cascades, less over the western lowlands and slightly more over the WA Cascades. So why has snow been generally light or absent over central Puget Sound? 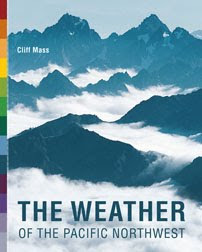 A major reason: winds in the lower atmosphere have been too persistently out of the Northwest, leaving Seattle in the rain shadow of the Olympics. 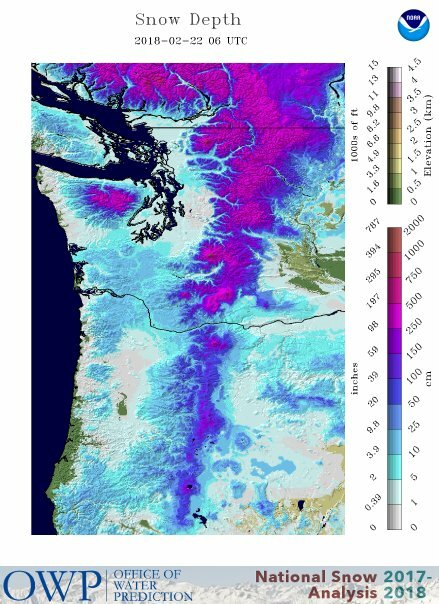 To illustrate, here is the National Weather Service precipitation analysis for the last week....lots of precipitation in the mountains, but major rain shadowing over Puget Sound. And with cold air over us, that means snow shadowing as well. Another issue is that the atmosphere is relatively dry west of an upper level ridge--and that is the pattern we have had for days (see map). Only when a strong trough works its way around the ridge and drives southward can we get real snow in Seattle in such a situation. Getting back to the current snow situation....snow should end during the next few hours as the upper trough moves by. Thursday should be dry. But we have another chance of snow on Friday, as two weak disturbances make their way south from SE Alaska to our region on Friday/Friday evening, and another on Sunday (see upper level maps for these times). There is a good chance for light snow over the lowlands on Friday...and much more in the mountains. Here is the European Center high-resolution 24-h snow total forecast between 10 AM Friday and 10 AM Saturday. Over a foot in the mountains and about an inch in the lowlands. 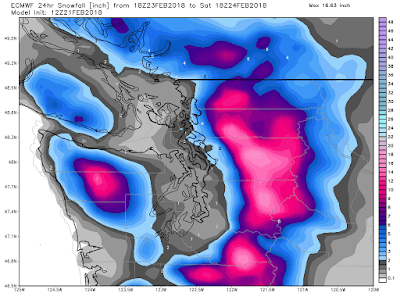 In their ensemble (many model runs), the Seattle accumulated snow forecast starting 4 AM this (Wed) morning shows the light snow today (good prediction of about a a half inch), but more (about an inch) on Friday. I should note that there is some uncertainty in the exact amounts, but some snow looks likely. So at this point, no big snowstorm in view (at least through Saturday), but enough to think about getting that hot chocolate and enjoying the flakes. 8 Inches of the fluffy white stuff on San Jaun Island, 200ft elevation. It fell starting at noon Wednesday and lasted until 7pm or so. Dreams really do come true. This seems quite out sorts with the forecast snowfall. Did we just get lucky? Any one else experience a dump like this? 2.25" in Winslow on Bainbridge Island. First time in a long time that a snowstorm has done its thing overnight then gotten outta Dodge; result has been an absolutely stunning bright sparkling clear morning. This sort of thing happened all the time when I lived in the Rockies decades ago and it's a rare treat when it happens here. Per the NWS forecast discussion from last night, an small (and unforecast) upper-level low materialized over the NE Olympic Peninsula and Whidbey Island last night and moved slowly south before dissipating. That's why many areas west of the Salish Sea got more than the trace to an inch originally forecast. 'Twas a nice surprise. We have a lot of snow sitting on the lawns and inter-roads here in W. Seattle. It will be interesting to see the snow coming again tomorrow (Friday). 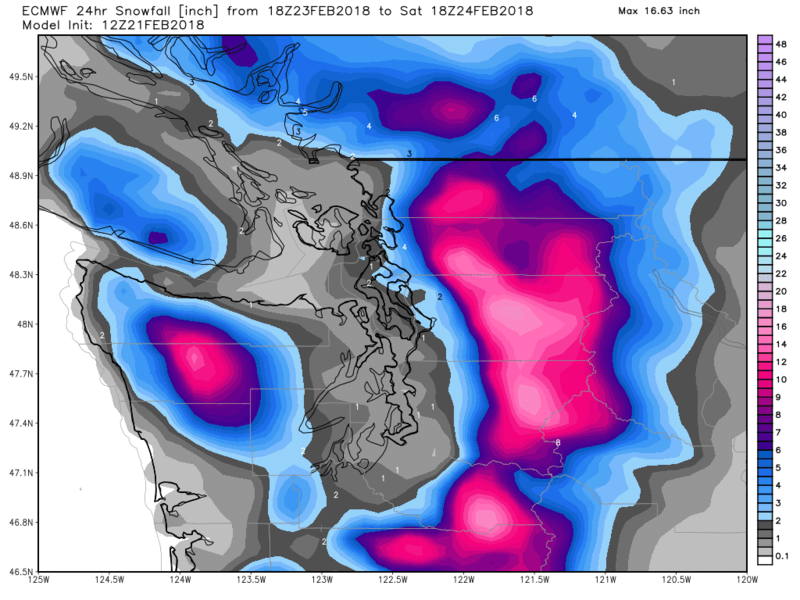 For what it's worth, add a 10-12" snow bulls-eye over the last Willapa Hill near Longview; we've had 5" 6"+ and 2" days with some compacting in between. Winters at our 750' site have been 'interesting' the past two years with 13" on the ground after Super Bowl LI and our current 12" deck total (KWALONGV31 at wUnderground). I may have to install a rope tow to get up our driveway! 3+ inches at 1000' feet near Sequim. Since Sunday, we've had about 8" at my house, and most of its still on the ground thanks to cold temps. This layer of fluff on top the heavier Sunday snow is wonderful stuff. My dogs are in heaven. It's deep enough to make thrown balls hard to find, which sends my Labrador Retrievers into a frenzy of joyful play as they sniff and root around, snow flying until they find the ball again. They never quit searching. There is no such thing as a lost ball to a good retriever. Only a temporarily misplaced one. 4" in Bonney Lake, it seems Federal Way got quite a bit too. None of our weather apps predicted nearly this much so we were all caught by surprise as it snowed all night and the local police closed many roads. Nice to see that Sea-Tac finally set a new record low,although the previous record was a rather warm 30 degree mark. Also,it should be noted that Sea-Tac had a run going of five consecutive max temps under 40.This hasn't happened in late winter (after mid Feb) since 1962. I see on the Bellingham nws weather discussion something referred as the KOLM-KBLI gradient. Where is that defined? I am guessing the KBLI means Bellingham Airport. What is KOLM? 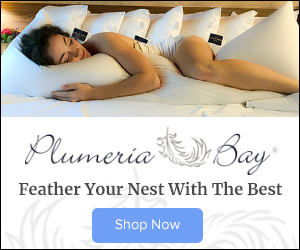 Is that Olympia International Airport? I am having trouble finding NWS acrynyms. Yes,KOLM is Olympia.Go to the NWS Seattle website.Under forecasts on the left,click on Marine Weather.When that comes up,go down to Marine Forecasts.There is a Northwest Pressure Gradients line that will bring up a chart of all the various pressure gradients between different weather stations.The pressure gradients can be a useful tool for forecasters in determining how powerful a potential windstorm may be.Also,the North Bend,Oregon-Seattle (OTH-SEA) is indispensable in the summer months when determining the approximate time of day when the marine stratus layer will burn off,or if not. My neighborhood in Tacoma sometimes seems to get a convergence zone going in these sorts of weather patterns (we got more snow than many other areas early last weekend and again on Weds. night). My assumption is that with winds from the NW that Federal Way-Tacoma-Lakewood is the equivalent of the Shoreline-Lynnwood-Everett convergence zone when storms are coming more from the SW. Fair assumption? Cliff, I've been missing your Friday discussions with Bellamy Pailthorp. Resuming soon? The Convergence Zone is getting no love again, although I heard the Zone might actually get some action going this evening. Looks like my house's streak of 2 or fewer inches of snow in a given "event" will be safe for yet another Winter (it's been going strong since 2013).